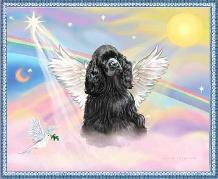 I’d like to introduce you to the Cocker Spaniel Rescue “Angels Under Our Wings”. It is a small non-profit group of volunteers in Victoria, B C that rescues Cocker Spaniels from high-kill facilities in California! They are always looking for families to adopt rescued spaniels, volunteers, foster families, and of course donations. Each cocker spaniel rescue costs at least $700 so any donation will be helpful! And a donation does not necessarily need to be financial, the Rescue also has a “wish list” on their website. There are some amazing pooches so please check out the website!